The Midwest faces a variety of pest control problems due to widely varying weather and climate, and since the area is largely made up of farm lands, pest control is a pressing concern. For the agricultural community at large, pests such as soybean aphids, spider mites, bean leaf beetles, and Japanese beetles pose a threat to crops, but for residential and commercial property owners there is a more common, potentially threatening pest- the American dog tick. Although ticks are most commonly found on animals, especially deer and dogs, they can also feed on humans. If you believe your dog has ticks, there are several signs to look for. 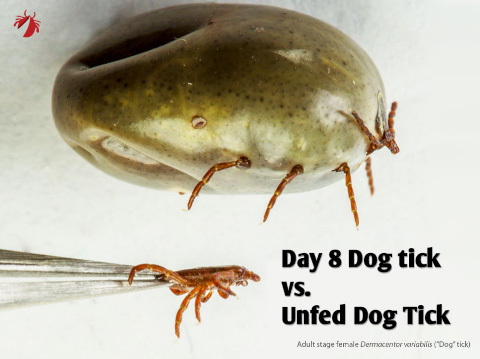 Fever is often brought on when a tick bite causes the dog’s body temperature to rise. This may become apparent if your dog starts to act more lethargic than normal. Loss of appetite can also be a clue that your dog is not feeling well. Other symptoms include soreness in the limbs, and skin infections can become apparent as well. But where did your dog pick up a tick? Dogs can get ticks from being out in wooded or open areas where insects are abundant, as well as being in contact with another dog that is already infested with ticks. Ticks have eight legs, and are usually light grey or brown in color. They are external parasites that grow in size once the tick begins to ingest blood. To remove ticks, wear surgical gloves and use alcohol to stun the tick before removing it. Stunning the tick loosens its bite. Without stunning the tick first, the teeth may be left behind, which could cause a skin infection. During the removal process it’s best to place ticks into a half-full jar of alcohol. This is a handy method because it kills the ticks, which can be easily flushed down the toilet later for disposal. Be sure to keep at least one tick for your vet to examine, in case of infections and sickness in your dog. Once all the ticks have been removed from your dog, it is best to apply an antiseptic, such as Betadine, to prevent possible afflictions. Any wounds should be small and heal quickly. In regards to preventing ticks, there are several natural methods for counteracting a case of ticks. Eucalyptus acts as a deodorizer and keeps ticks from wanting to attach to the dog. Another technique is lavender, which also repels ticks by smell. Counteractive methods are a good idea if you are taking your dog on walks through tall grass during April through September. Also, be sure to check your dog for ticks after walking in possible infested areas, or after being near dogs that might have ticks. A good place to check your dog for ticks after a walk is behind the ears and around the eyes, as those tend to be starting locations for tick problems. With the right prevention, your dog can have a healthy summer and stay tick free. Please call Romar Pest Control if you believe you need tick control at your property.